Well, well, well, look what we have here. Another fighter enters the fray of full-frame mirrorless cameras! In the run-up to Photokina 2018, Micro Four Thirds powerhouse Panasonic announced the development of not one but two professional-level full-frame mirrorless cameras, the Lumix S1R and Lumix S1. A long-time partner in the Four Thirds system, and subsequently one of the co-developers of the mirrorless Micro Four Thirds system, Panasonic has been a leader in developing cameras around rather small sensors. Back in 2008, Panasonic debuted the world’s first digital single-lens mirrorless camera, the Lumix G1, and now ten years on, they are starting a new chapter — with a new sensor size. Among professionals, Panasonic’s GH-series MFT cameras have been extremely successful, especially for videographers; the latest GH5 and GH5S cameras, especially, offering a slew of professional-level video features, and the image quality and performance to match. With the new Lumix S series, Panasonic is aiming to take their photo and video expertise of their Micro Four Thirds system to the next level, offering an even higher-end, truly professionally-focused camera system. In a similar strategy to Sony’s A7R and A7 models, the Panasonic S series comes in two different flavors: one high-resolution body that’s designed more squarely for still photographers, and one with more modest resolving power, but that’s aimed as more of a photo/video-hybrid camera. With both models powered by an all-new Venus Engine image processor, the Panasonic S1R sports a 47-megapixels sensor, while the Panasonic S1 comes with a more manageable 24-megapixel sensor. 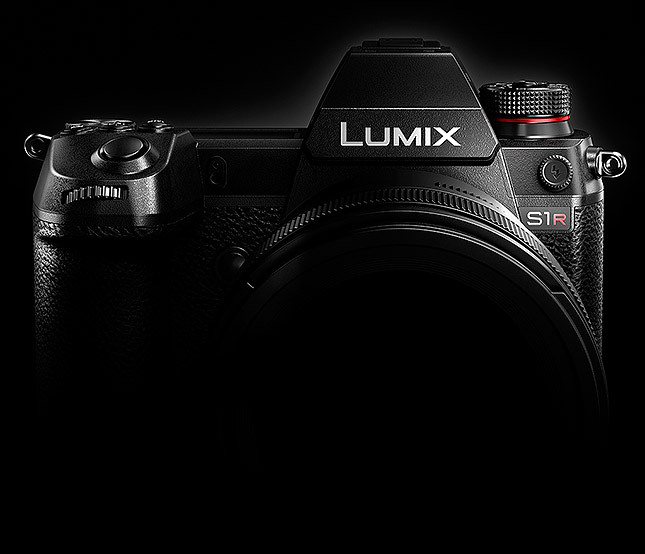 However, Panasonic did clarify that despite the Lumix S1 being the more photo/video-hybrid model of the two S series cameras, it is still more photo-centric than the GH5/GH5S cameras. We don’t yet know the full specifics of the S1R and S1’s video capabilities, but nevertheless, the S series cameras are aimed more at still photographers. That said, being Panasonic, the video quality of these two cameras is likely to be impressive. As mentioned, this is just a development announcement at this point, so details of these cameras’ video features are limited, but we do know that both the S1R and S1 cameras will offer 4K UHD video up to 60 frames per second, making them the world’s first full-frame DSLM cameras with 4Kp60 video. Panasonic was the first to introduce 4K video to a DSLM (in the GH4), and then the first DSLM with 4Kp60 (in the GH5). Panasonic made a huge splash with their GH-series for videographers, so it’s exciting to see them push the envelope here with their full-frame mirrorless cameras. A long-time maker of optically-stabilized lenses, Panasonic then debuted in-body image stabilization with the GX8, creating Dual I.S. in which lens stabilization worked in combination with sensor-shift stabilization. Since then, Dual I.S. and Dual I.S. 2 have made their way into the most of Panasonic’s Micro Four Thirds cameras. With the S1R and S1 cameras, Panasonic brought their Dual I.S. technology to full-frame. Now, according to Panasonic, the inclusion of Dual I.S. is a “world’s first” for a full-frame digital interchangeable lens camera. But, it should be noted that Sony’s had their 5-axis SteadyShot sensor-shift technology for some time now, starting with the A7 II, which can work in conjunction with optically stabilized E-mount lenses. But, when it comes to full-frame cameras with Panasonic’s “Dual I.S.” brand of image stabilization technology, then yes, the S1R and S1 cameras are a first. Despite the differences in image resolution for these two models, the S1R and S1 cameras are identical in shape, styling and ergonomics. Based on a prototype mock-up camera, or woodblock model, the Panasonic S1R (and S1) looks and feels like a larger brother to the Lumix G9. The camera offers a deep, comfortable handgrip, ample room for numerous physical controls and dials, as well as a large top-deck info display. The rear LCD design is new, however, compared to the G9, offering a handy three-way tilting design much like that of the Fuji X-T3, for example, allowing for easy viewing in both portrait and landscape orientations. Both S series models are fully weather-sealed, as we’d expect given their professional, flagship nature. Panasonic claims both cameras are “100% sealed,” though we certainly don’t wouldn’t consider them “waterproof,” but they should safely withstand dust, moisture and freezing temperatures. 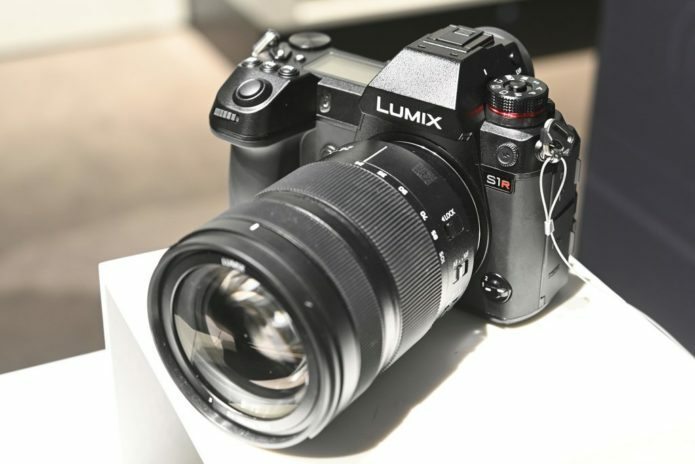 According to Panasonic, the S series cameras are weather-sealed to the same degree as the Lumix G9 and similar in ruggedness as the Canon 1D-series or as Nikon’s flagship D-series DSLRs. One physical design feature that’s sure to please professionals, advanced users, and many other serious photographers and videographers is the inclusion of dual memory card slots — one XQD and one SD, in fact. Both Canon and Nikon’s recently-announced full-frame mirrorless models offer just a single card slot, SD for Canon, XQD for Nikon. Not only do dual card slots provide the ability to expand your storage capacity and save media to the spare card once the primary one is filled, but they can also be configured to offer on-the-fly backup (recording media to both cards simultaneously), saving you from potential disaster should one card fail and become corrupted. Many professional flagship cameras, such as the Canon 1D X Mark II, Nikon D5, the Sony A9 as well as Panasonic’s own GH5 and G9 cameras, offer dual card slots. Seeing as the Lumix S1R and S1 cameras are designed with the professional photographer and videographer in mind, it makes sense to see dual card slot support offered in these cameras. Details about shooting modes, performance features, and continuous shooting rates, for example, have not yet been announced and are likely still being developed and fine-tuned by Panasonic’s engineers. However, we do know one important detail about the autofocus system. Much like Panasonic’s other Micro Four Thirds cameras, the Panasonic S1R and S1 both use contrast-detect AF with DFD technology; the S series cameras do not have on-sensor phase-detect pixels like most other full-frame mirrorless cameras. The Leica SL, another full-frame mirrorless camera that happens to share the same lens mount as the Lumix S series (more on that below), also uses DFD technology for its autofocus. In our review, we found the Leica SL’s AF performance to be excellent for still subjects but struggled somewhat to keep up with fast-paced subjects. On the other hand, the Lumix G9, Panasonic’s photo-centric flagship MFT camera, also uses DFD technology, and our Field Tester found its continuous AF performance to perform rather well, even on small birds and with long telephoto lenses. We can’t wait to test out the S series C-AF chops once we get a shootable sample! Details about the number of AF points and AF point coverage have not yet been released. One of the major stories around these new Lumix S1R and S1 camera is the lens mount; they utilize the Leica L mount — the same mount that’s on the Leica SL. Panasonic and Leica have long had a strategic partnership, not only on lens designs and manufacturing but also sharing certain camera models. They’ve now taken the partnership to the next level, not only incorporating Leica’s L mount into their cameras and lenses, but also bringing on famed lens manufacturer Sigma to form a new L-series Alliance. It’s a pretty strategic move on Panasonic’s part. In launching an all-new camera system with a “new,” or rather a different lens mount than their already-existing lens products (MFT), Panasonic isn’t fresh out of the gate with a new camera system with little to no lens support, both natively or from third parties. By using the L-mount, the Lumix S1R and S1 camera can already take advantage of the current selection of Leica L-Mount lenses. Panasonic will also design and build their own native L-mount lenses, starting with a 50mm f/1.4 prime, a 24-105mm standard zoom (aperture unknown at this time), and a 70-200mm telephoto zoom (aperture also unknown). They’ve also announced a broad lens roadmap, expanding the native S series lenses to more than ten different models by 2020. As for Sigma’s role in this new L-mount Alliance, their new products or roadmap are still unknown at this point, but we wouldn’t be surprised to see L-mount versions of some, if not all, of their high-quality Art-series lenses. Pricing for both the Panasonic S1R and S1 cameras are not yet available, but Panasonic has stated that both cameras are slated for release globally in early 2019.